The inflammation associated with acne lesions can damage the deeper skin layers, leaving various types of scars. We routinely see patients who have wasted hundreds if not thousands of dollars by seeing non-medical practitioners at beauty salons and spas and trusting them to fix their acne scars. Only medical clinics with experienced clinical staff and high-end lasers are equipped to tackle different types of acne scars effectively. As mentioned above, there are at least 4 different types of acne scars of variable severity and there fore there is no single treatment to fix all of them at once. 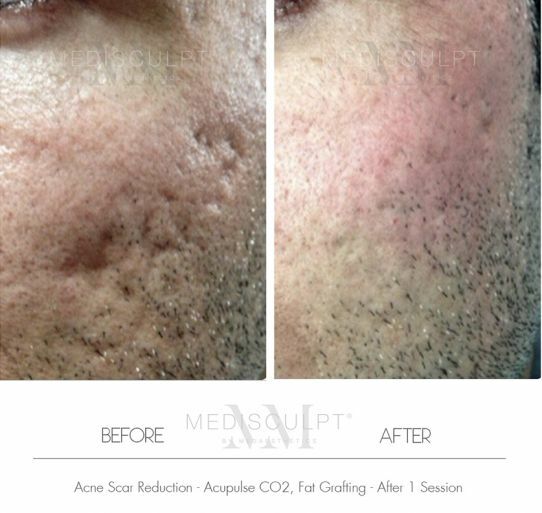 How are the acne scars treated at Medaesthetics? Medaesthetics®, is possibly the only clinic in WA to offer the following treatment options to address almost any type of facial scarring, under the one roof. Its considered the gold standard in treating acne scars. It is excellent for improving mild to moderate depth Boxcar and Rolling Scars. It is also good for reducing the size of hypertrophic scars. However, it is not suitable for dark skin patients as first line therapy (due to the risk of hyper pigmentation) and also not able to completely fix deep scars on its on. Down time is about 2-3 weeks of redness and peeling and therefore it is not suitable for busy professionals who are unable to take time off work. The treatment takes about 15 minutes. Treatment area is anaesthetised for 40 minutes before hand and most patients find it to be a very tolerable procedure. We often combine PRP (Platelet Rich Plasma) treatment with this procedure to deliver maximum skin renewal and minimise down time. Pros and cons are similar to the Fractional CO2 laser(described above) but it is considered to be less invasive than CO2, hence less down time, less cost and lower risk of post inflammatory hyper pigmentation. Suitable for patients with slightly darker skin and mild to moderate scarring. 2-3 treatment sessions are needed over a period of several months. Downtime is about 5 to 10 days of redness and swelling. We often combine PRP (Platelet Rich Plasma) treatment with this procedure to deliver maximum skin renewal and minimise down time. At least 3 treatment sessions are recommended over a period of 6 to 8 months. This is not our first line treatment. We use this treatment in conjunction with fractional skin resurfacing as a finishing touch procedure. It improves superficial scars, enlarged pores and provides excellent anti-aging effect. Treatment of choice for patients with darker skin. Indian, Asian, Middle Eastern and Hispanics. Less expensive than Laser skin resurfacing with less downtime and less risks of any side effects. However, 3 treatments of sublative radio-wave are needed as a minimum to see visible results. Often combined with deep skin needling and TCA cross to deliver maximum results. Downtime is about 7 to 10 days of redness, swelling and bronzing (temporary brownish discolouration of skin which last for a few days). This is the procedure where the under surface of a scar is released/separated from the deeper skin layers to help the depressed/ indented area “lift up”. Subcision is the treatment of choice for all deep scars where the scarred tissue is tightly attached to the deeper skin. At Medaesthetics, we routinely perform subcision procedure which is then followed by micro fat grafting and/or fractional laser skin resurfacing. The procedure is performed under local anaesthesia of the treated area. Downtime is a few days of swelling and bruising. This technique combines subcision of depressed/ atrophic scars with several sessions of suction applied to the treated area over a period of 2 ,3 weeks. This method is only useful for tackling mild to moderate atrophic scars. It is not useful for severe tissue atrophy where micro fat grafting remain the only treatment of choice to replenish tissue loss. Radio-wave device is used to gently shave off the nodule like, hypertrophic scarred tissue to make the area smooth. This procedure is only used to treat large atrophic scars. Useful for advance hypertrophic scars. Several sessions are needed. Using 50%-100% TCA Solution. The procedure involves application of the TCA into every single Icepick acne scar and enlarged pore to close it down by stimulating target skin growth in the treatment area. The procedure is performed after the application of topical anaesthetic cream and is well tolerated by all patients. It takes about 30 minutes to perform. We routinely combine TCA Cross with Full Field and Fractional Skin Resurfacing procedures to deliver optimum results. More than 3 treatment sessions are needed with 6 to 8 weeks interval in-between. Micro fat grafting is the gold standard in treating deep Rolling and Boxcar type acne scars. In fact, this is the treatment of choice for any skin trauma or condition where localised tissue is lost. Fat is harvested from inner knees or love handles and gently injected in the skin under the scarred tissue (after submission). Stem Cells found in the fat, work amazingly to rejuvenate the skin. The procedure takes about 90 minutes and has a downtime of about 7-10 days of redness and swelling. It is done under local anaesthesia and well tolerated by patients. We routinely combine this procedure with other treatment options to treat deep scars. Skin needling (including derma pens) is routinely advertised as a great treatment for Acne scars by many beauty salons. However, the needle size of at least 2mm and above is required to treat mild to moderate depth scars and in our experience this procedure delivers suboptimal results when performed alone and not combined with other treatment modalities mentioned above. We routinely combine Medical Skin Needling with TCA Cross, PRP and Fractional Lasers to treat all forms of acne scars. However, we talk our patients out of having this procedure for acne scars. As a stand alone procedure, it is a good skin rejuvenation procedure but not a good scar reduction option. This procedure is reserved for a small amount of acne scars which fail to respond to all above treatments. As a last measure, the scarred tissue is cut out using very fine scalpel after the area is completely numbed by local anaesthesia. Sutures are placed to close the wound and they stay in for about 5 days. Once the sutures are taken out, the area is treated with fractional skin resurfacing. The cost of your Acne Scar Treatment program depends upon the type and extent of your scarring. Each patient is unique and requires a different treatment regimen. This is assessed during the initial consultation with the treating doctor. A treatment is mapped out for each client and the cost can be assessed at this time.